Lionhead rabbits are the new breed of Dutch dwarf rabbits because they are the result of crosses among Dutch dwarves and various types of foxes and Jersey wooley. 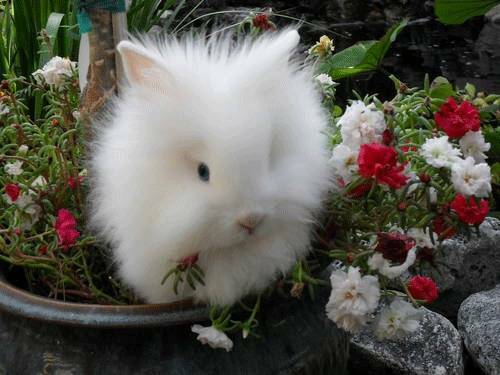 They are named as lionhead because they have large hair like lion around their head, this unique breed of dwarf rabbits originally belonged to Belgium but currently they are available in United States and they are exported to different countries of world form US. These rabbits weigh between 2.5 pounds to 3.75 pounds and usually their head, neck, chin and ear will be covered with opaque covering of fur. Lionhead dwarves do not easily adjust in the new atmosphere and they take more time to become social and civilized as compared to Dutch dwarf rabbits. These rabbits have very aggressive nature and usually they fight with each other particularly with female rabbits, therefore make separate cage of female rabbits and brought them into the cage of male rabbits only for breeding. They can easily harm your kids with their sharp and white nails; therefore do not give them to your little kids before proper training. If they become injured during fighting with one another then consult to any veterinary doctor for their treatment because rabbits have very delicate and sensitive skin and bones. The back legs of lionhead rabbits are not very long but they have more fur as compared to front legs and some rabbits have more dense fur on their chest and cheeks and their chin will be completely covered in long and thick fur. As this is the latest breed of dwarf rabbits therefore pet lovers have to face difficulties to find detailed information about the grooming, training and feeding of this rabbit. There are two types of lionhead rabbits according to their mane such as single mane rabbits and double mane rabbits. The single maned rabbits are the product of lionhead dwarves with other rabbits and their mane will be very thin and it usually purge as they become older. Doubled mane rabbits are the product of two lionhead dwarves or two single maned rabbits, the rabbits of this breed have very thick mane around their head that will eventually cover some part of their back. This mane will not disappear with any change of weather or with growing age of lionhead dwarves. The information about their life expectancy of lionhead is not available but it is estimated that their life span will be similar to ordinary Dutch dwarf rabbits. As the fur of lionhead rabbits is very long therefore you must use the specific wooden hutches and cages that are designed for lionhead dwarves, the cages of lionhead are designed in such a way that their fur will not catch in the cages. You must provide a large area to your rabbits for playing and exercises and this area must not be less than a square meter and you can also provide different toys to your rabbits for their entertainment.